The members of a punk band battle for their lives after witnessing a murder by a skinhead gang. 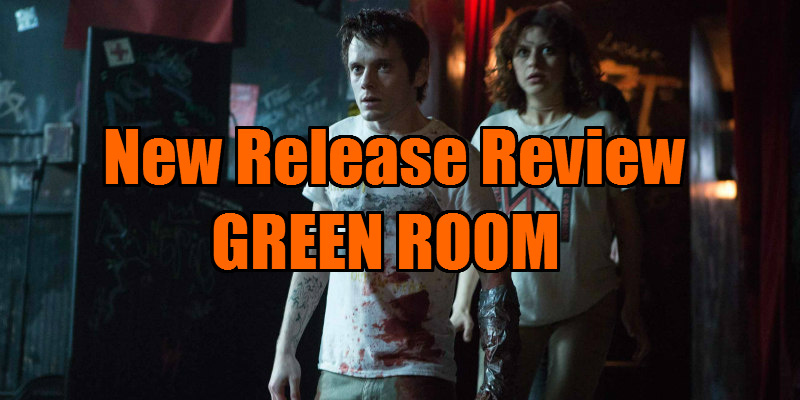 Like any good punk gig, Green Room is best experienced with an audience, as Saulnier manipulates us into pogo-ing out of our seats in terror. 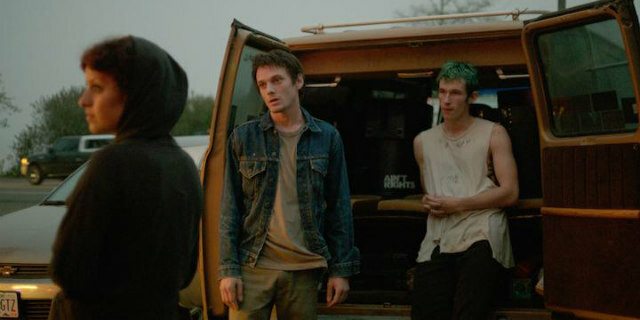 Whether punk is dead or not is an ongoing debate, but on the evidence of Green Room, down and dirty genre cinema is alive and gobbing in our faces. Six years after his debut with Murder Party, writer-director Jeremy Saulnier returned with a vengeance with 2013's critically acclaimed revenge drama Blue Ruin. 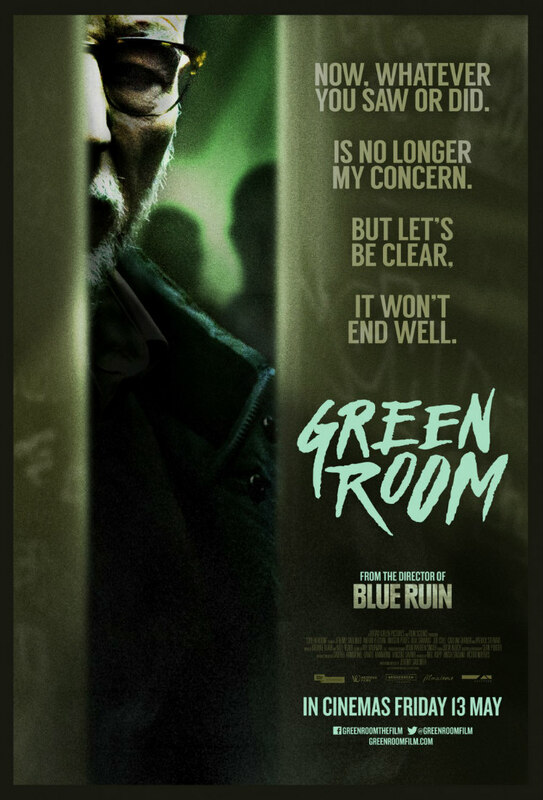 Thankfully he hasn't left such a long gap to give us his third feature, Green Room, which plays, in the very best sense, like a debut - it's raw, edgy and feels like we're watching a filmmaker ejaculating years of pent-up ideas on the screen. The Ain't Rights are, as you might expect in 2016, a struggling punk band, wandering from town to town in the American North West in search of low paying gigs, siphoning gas from parked cars to keep their beat up van moving. After getting stiffed by yet another promoter, the band find themselves playing at a roadhouse venue that doubles as a meeting point for skinhead white supremacists. They don't exactly endear themselves to the crowd by opening their set with a cover of The Dead Kennedys' 'Nazi Punks F Off', and things get worse when they venture backstage, now a murder scene thanks to a skinhead plunging a blade into the head of a teenage girl. What follows is one of the most unbearably tense cinematic experiences you'll have had in quite a few years, as the band members lock themselves in the venue's green room while Patrick Stewart's gang leader assembles his troops outside. We're currently reaping the rewards of a generation of filmmakers raised on the genre fare of John Carpenter and Walter Hill, and Green Room mashes together the central hooks of Assault on Precinct 13 and Southern Comfort, amping up the violence to an alarmingly realistic degree. At a brisk 95 minutes, Saulnier keeps his film moving, but while it's quickly paced, it never skimps on characterisation. Amid the chaos and paranoia we get to know these people, which makes their violent outcomes all the more shocking. While Stewart and his young hoods are essentially cartoon villains and unmasked slashers, our protagonists are very real and flawed. Asked to name their favourite bands by an interviewer early on, they opt for obscure punk bands, but later, facing what seems like certain death, they reveal the truth about their not quite so esoteric taste, and there's a wonderful moment late on featuring a savage dog that subverts all expectations. While he's undoubtedly technically adept, it's these moments of humanity that make Saulnier stand out from the masses of filmmakers whose violent thrillers disappear into streaming obscurity. Much has been made of the casting coup in relation to Stewart, and he's as great here as you might imagine, but it's the reteaming of the Fright Night remake's Anton Yelchin, as the reluctant band leader, and Imogen Poots, as a skinhead girl who teams up with our out of depth protagonists, that really seals the deal here. Poots is at her career best, channelling the spirit of the cynical anti-heroes essayed by Keith Carradine and Darwin Joston in the aforementioned Hill and Carpenter thrillers. With Poots confessing to her ambiguous hatred of non-whites early on, Saulnier has the balls to present us with an outwardly unlikeable character, only to have us cheering for her by the third act. Likewise the band members, who initially present themselves as a bunch of narcissistic tykes. This isn't a simple case of good guys against bad guys, rather not so good guys against very, very bad guys.